Hagakure (‘In the Shadow of Leaves’), a poetic name for a poetic book. 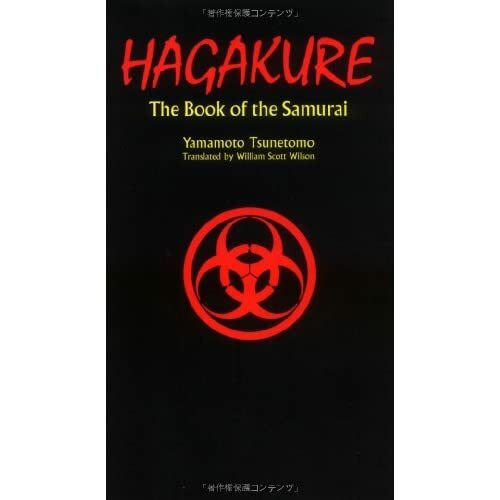 Hagakure is a book that captures the words of Yamamoto Tsunemoto, it is a book by the samurai for the samurai. It is a collection of sayings, short stories and codes of behaviour, it does not follow the traditional rules of a story or a manual. It is written in a style that is mostly unknown in the West, yet it carries all the more weight and interest for those who can only imagine what the book is trying to portray. Hagakure does not seek to explain the philosophy of the Way of the Samurai, instead it explains the ground rules that will turn a samurai into a servant of truth, his master and himself. The logic that is followed throughout the book is that of absolute determination and complete clarity at any point in one’s life – only through this way can a man achieve perfection. It is an attitude very different to that of the modern world, the focus is on intutition, logic is mostly frowned upon. Why indeed should one listen to logic, if through being in the correct state of mind and knowing one’s purpose and liabilities, any situation is resolved before it even happens. The Way of the Samurai is a way of immediacy. It is also a way of servitude, for everything is done in service of one’s master. It is a way to follow by living as if one was dead at any and all moments. Only through accepting one’s death at any given moment, may a man live without fear of death. In Hagakure it is told that death should be celebrated, not feared. A certain swordsman in his declining years said the following: In one’s life there are levels in the pursuit of study. In the lowest level, a person studies but nothing comes of it, and he feels that both he and others are unskillful. At this point he is worthless. In the middle level he is still useless but is aware of his own insufficiencies and can also see the insufficiencies of others. In a higher level he has pride concerning his own ability, rejoices in praise from others, and laments the lack of ability in his fellows. This man has worth. In the highest level a man has the look of knowing nothing.